Ever since I was little I always have had a way with horses. In a sense, it’s almost as though we are energetically connected. In short, we understand each other. And I know that for many people, that’s not the case. Most horse owners I know LOVE their horse, however, not everyone has the same connection when it comes to training. What I’ve noticed is when it comes to people teaching their horse how to do things they get all wrapped up in the techniques and lose the connection with the horse. They also don’t realize how their own energy affects the horse and the connection you have with them. Horses live in the moment and are very in tune with energy. If the owner has a bad day is angry and goes to work with the horse things may not go smoothly because they sense the negative energy and don’t respond well. In 1995 I got involved with the Parelli Natural Horsemanship program. After being with PNH for awhile I was accepted into their student instructor program. As a student instructor, I began coaching and helping other students by showing them how to communicate with their horse. After several years of watching and helping people with their horses in the PNH program, I felt like there was still a better way to communicate with horses. What I was seeing was horses that were getting frustrated and being forced to do things using fear and intimidation and I knew from personal experience that it didn’t need to be that way. So I went on a quest to find a better way for people to be able to communicate with and train their horse. What I found was something called “Clicker Training”. I started watching videos of people using clicker training with horses, but the majority of them were teaching tricks. What I saw was a tool that could be used for so much more than just teaching tricks. I have performance and show horses and saw clicker training as a very powerful communication tool that could be used to improve the horse’s performance in a shorter period of time. After watching lots of videos and reading a few books I decided to try it myself and invested in a course to learn the method. This communication tool made a huge difference with all 11 of my horse’s plus my miniature donkey! There was no turning back they all loved it and responded really well. 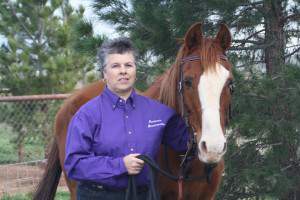 I began to develop a system that incorporates positive reinforcement training with the Passionate Horsemanship holistic methods plus much more and teach it to my students so they too can get amazing results. My students have been able to get the results they want easily in a shorter period of time, they and their horse gained more confidence; saved time and money not having to send their horse off to a trainer and they developed a deeper bond with their horse. Now I enjoy teaching these methods to even more people through my online and in-person training programs. I truly believe that you can easily learn these methods I teach and my passion lies in helping you to effectively communicate with your horse, gain more confidence and get the results you want without using force, fear or intimidation. Discover how I can help you to achieve your goals and dreams on my programs page.